My house doesn't have an attic or basement, so "everything else" goes to the one-car garage. Theoretically, anything stacked near the door is on its way to a better place; in reality, the overflow waits there for a while. A long while. 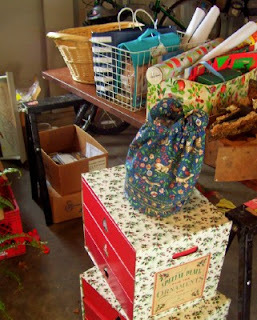 My husband set up a Christmas wrapping table, using an old door and sawhorses. Brrr! Now the supplies are piled up on my washing machine instead! We bought this workbench at a yard sale down the street. I don't like the look of all the tools out in the open, but hey, it's not my space, is it? 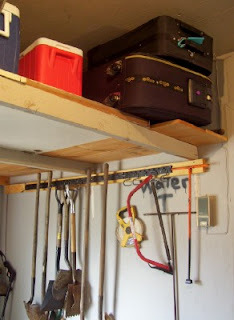 The loft above the work area holds luggage, coolers, and outdoorsy equipment. I promise, not a one of these boxes belongs to me! My husband's not ready to part with family memorabilia. Yet. He measured how high two paper boxes stack, then built a shelf 22 inches from the ceiling. It's nice that you have overhead space. I was about to be envious, but then I remembered that we have attic space over our garage. It's nice to have an attic, but due to the extreme heat here in Texas, we still can't store much of what needs to be stored up there. For example, the wooden Halloween cats my husband made for our yard got all warped up there. And my wedding dress is taking up a ridulous amount of closet space because the heat of the attic would destroy it. We do have attic space, but it is not decked in all the way. We store our Christmas bins and kid's clothes up there. The rest we squeeze into our one car garage, as well. It does help limit what we keep. I actually park my car in the garage and because it is deep we have room for storage shelves, etc. Hubs and I would love to take down the old rickety shelves at some point and put in more heavy-duty shelving. It would hold more for sure...one day. Neither an attic NOR a basement?! Yowza! I have some pitching to do! We've got both, AND a 1.5 car garage. I am ashamed. We have an attic space. Yes, it does have a floor too. We do not store much up the because we are in Texas and the heat build up in the summer destroys anything and everything we put into the space. We inclosed our 2 car garage space about 15 years ago to become my day care space. We built a 'stand alone' two car garage/work-shop for my husband in the back yard. 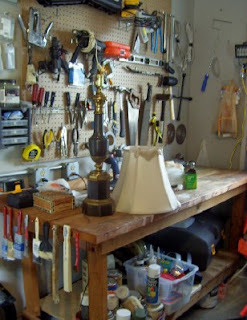 My husband does alot of wood working-honey do things for me and he did need the space for lawn care items etc. too. We have a covered parking area for our two cars in front of our home..it works well. We have always had just a pull-down attic, however inaccessible and inconvenient. I'm not sure which I prefer. With the attic, you stick things in there and forget they are up there. The garage is conveniently close, but everything you put there gets in the way of actually using the garage. I ask because I always wonder if I sometimes overestimate the amount of space I actually need to store decorative seasonal items. Your husband storage shelf is very clever and neatly organized. The workspace area, too, is great. It's visible but everything has a place and is easily accessible. This home is just under 1600 square feet. I would never purposefully get a larger home because this is ALL I can keep clean. Our last homes were 1200, 1100, and 900 square feet, respectively. But we used a LOT of attic space to store these kinds of things there. We moved a great deal- and accumulated lots of stuff. My husband's solution? Our final house (which is this one) has a 2200 sq foot barn! LOL. No, it is not even close to full- in fact it is quite empty. It is becoming his workshop for making doors and chairs for a part time retirement income. No basement or attic storage space here, either. We do have attic pull-down stairs, but a person can't stand up in there, so we can only push a few empty boxes in between the maze of rafters and cross beams. 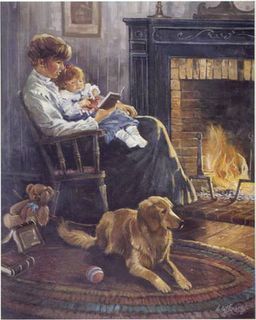 We've lived in this home for 15 years now, and raised three children. We have all learned to be less consumptive (some better than other, I must admit!) and pass on things when we no longer need them. I have a garage sale every year to get rid of the stuff. We do have six ft metal shelving units on one wall in our two-car garage, to store camping equip, Christmas, yard and garden, paint, auto, and archived records. Mementos are on bedroom closet shelves. I even sold our artificial xmas tree and started buying a cut tree every year, just so we wouldn't have to make storage space for that big tree box. I'm saying all this to encourage others to live in a more frugal way. It can be done, and we actually live a more satisfying life than many of our friends because we don't have to care for nearly as many possessions. No garage here! We hope to build one this summer, but we'll see. We just put Christmas bins away in the small attic space above the old garage now office - it is a real pain, but I am so grateful for the space! 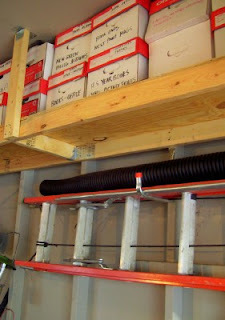 We have a crawl space so no storage their either - it kind of interrupts the 'system'! We used to take everything we were not using to the basement and than twice a month go through it and take it to Goodwill or friends who could use it! Have you seen the snap together attic flooring? It looks so cool - in an afternoon you can create space in the attic - and since it isn't fastened down it could go with you to the future house. It doesn't interfere with the insulation and looks really sturdy. Since it is something 'new' it's bound to be pricey, but I don't know. This is a great series. Our house is a 1950s cottage--originally 1180 sq ft with a single garage--no basement. I will show my husband these great photos for ideas as we are always reorganizing something. We don't decorate for Christmas until almost Christmas Eve, so I am enjoying my Christmas decorations while puttering around tidying up the messes that were left behind while we were playing Santa's elves at the sewing machine and in the garage.